OTHER ART MOVEMENTS | RUN! RUN! RUN! 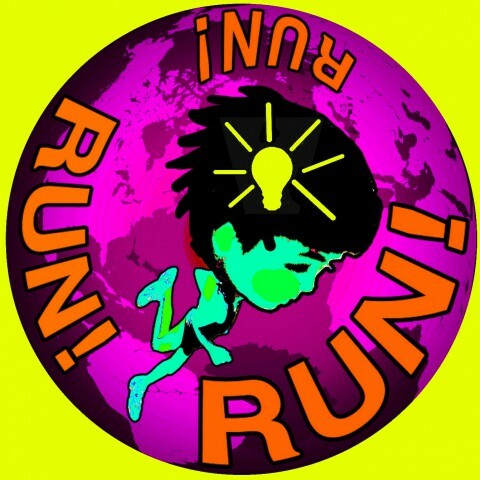 Keen to learn about where RUN! RUN! RUN! International Body For Research comes from? 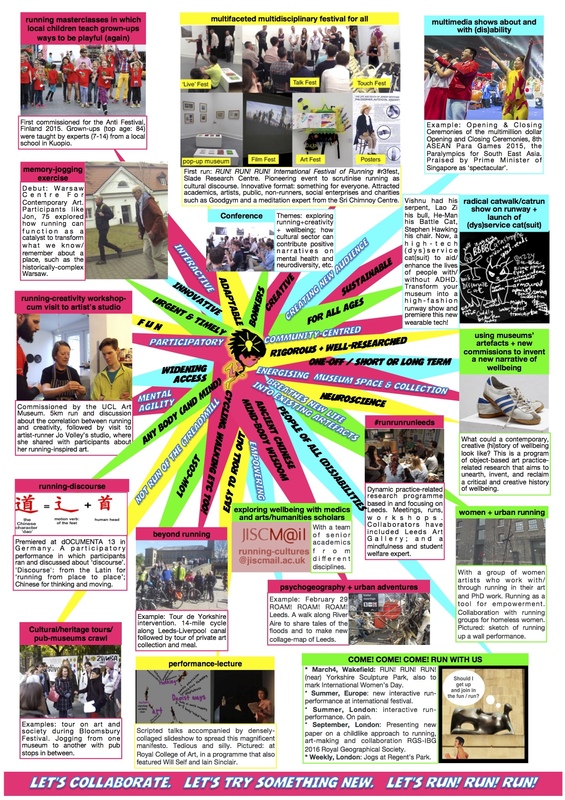 Eager to see how this way of thinking about running may be translated into or applied onto other movements so as to re-configure them into creative devices beyond just movement/exercise/sport? Curious about the possibilities of movement and art, art as movement, movement as art, art about movement as an art movement in itself? Then click on the links to learn about Kai’s study of other movements in her practice-related research since 1994. Many of these films, installations, performances and so on of the past 20 years addressed restlessness as a subject, and had a restless approach. The movement helped structure her works, and this perhaps could be related to her 12-year of training in classical music. 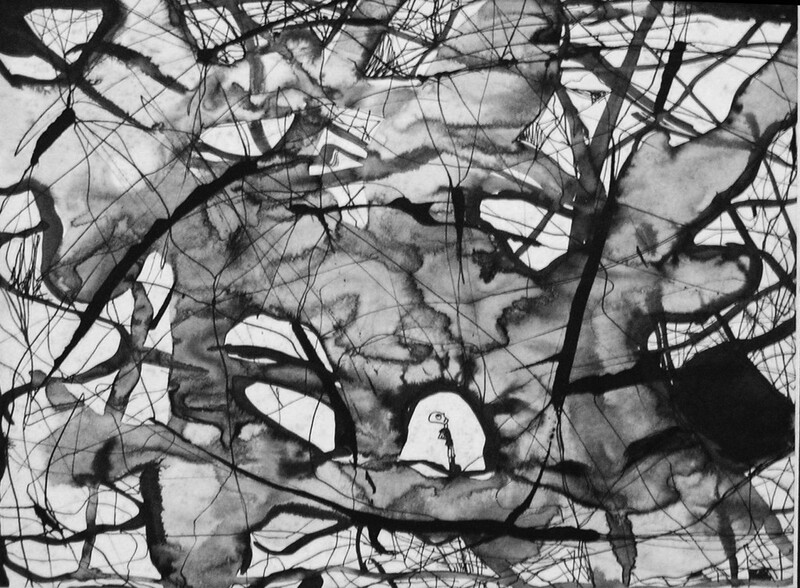 These works were often densely-collaged, cutting across genre, discipline and media. The real genesis of the notion of running as a creative toolkit began when Kai was a young (day)dreamer who dreamt of ‘running away’ from the claustrophobic reality by letting her imagination run wild. This was translated to an array of paintings, cartoons, sculptures and installation. Several of her very early works have a science-fiction or fantasy theme, or feature some form of a mapping of the world or another. Then, she ran away from home, and began living her life on the run. In London, Kai was fascinated by the new world (order/disorder). She began her voyage of discovery of a range of issues and media. Influenced by Structuralist filmmakers like Peter Kubelka and fascinated by notions of repetition, banality and meaning, she created a set of short Super 8 films featuring herself engaged in banal exercises like chewing, skipping, doing sit ups, or generally sitting around, wasting time. This was also the start of the use of her own body as medium and subject. Even though Kai was living in London, she was restless. 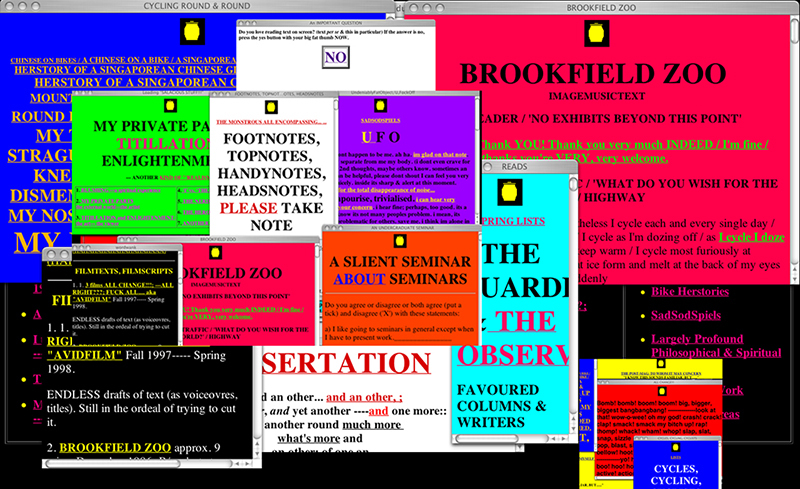 Hence she ventured online with a large-scale hypertext work, called mY uNOFFICIAL dUMPINGGROUND (1997). Those were the early days of the internet. The work was not just an archive of her text works, but a self-reflexive exploration of the medium. It generated a multitude of hyperlinks connecting subjects in ways sometimes logical, but mostly absurd. She wanted the audience to click endlessly and hence, travel, virtually, restlessly, and ‘end up’ in surprising sites that extrapolate from or digress away from where they started. Finding street protests and public gatherings in London exotic, she filmed them. she edited a trilogy of cine-essays. ALL CHANGE!!! — ALL RIGHT??? F.ALLL… (1998) are in 3 distinct styles, but used images and sounds from the same archive. The films could be watched independently as shorts, or together as an extended cine-essay totalling 45 minutes. She wanted to question the value between art and politics. She was influenced by the ideologies and approaches of French auteurs Chris Marker and Jean-Luc Godard, and Soviet filmmaker Sergei Eisenstein. She employed a classical actor Declan Conlon to do the voiceover. One of the films won an award at the San Francisco International Documentary Film Festival 1999. Upon returning home after 4 years of absence, Kai felt adrift. This was also when she began to teach in a film school, where there was a swimming pool. She started swimming. Her cine-essay Chlorine Addiction (2001) was structured as a swim, with a series of 10 videos with a runtime of 3 minutes each, which was the time I took to swim each of the 10X100 metre laps daily. Once again, the films encourage the audience to ‘re-map’ or re-order and edit them. They may be viewed independently, in any order, as short films or an installation in space, or from the ‘beginning’ to ‘end’ as a linear film. 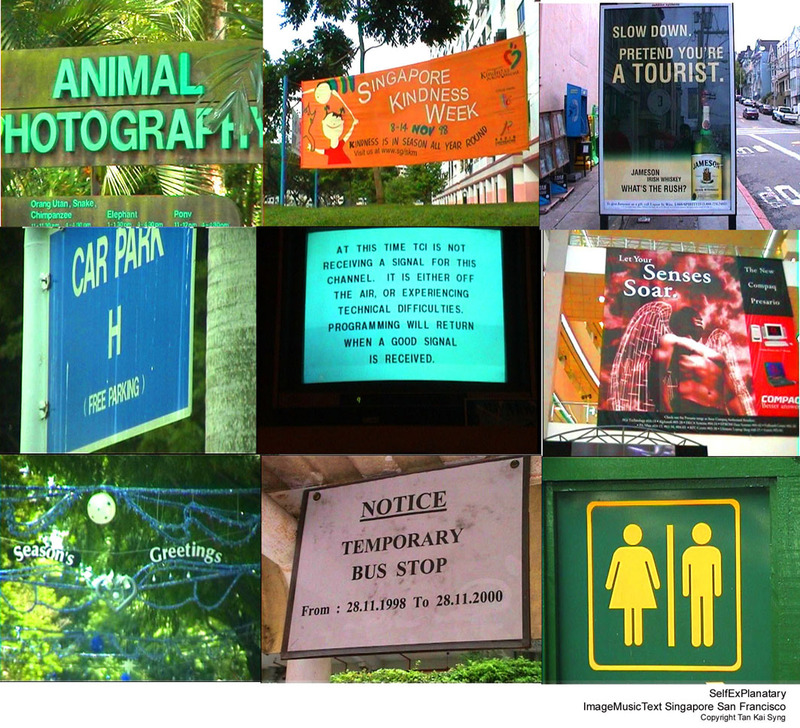 Using images and sounds collected from Singapore, San Francisco, Bangkok, Taiwan and elsewhere, the work contemplates the everyday, rather strange, reality of Singapore and existence in general. 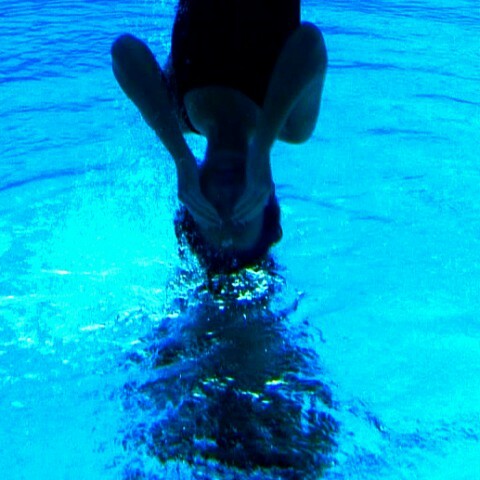 Chlorine Addiction was one of Kai’s most popular works. It was in the Official Selection at Transmediale and the Yamagata International Documentary Film Festival 2001. An early version of a clip was collected by the Fukuoka Art Museum in Japan. She also published a book which is distributed by Select Books, and produced an interactive DVD. 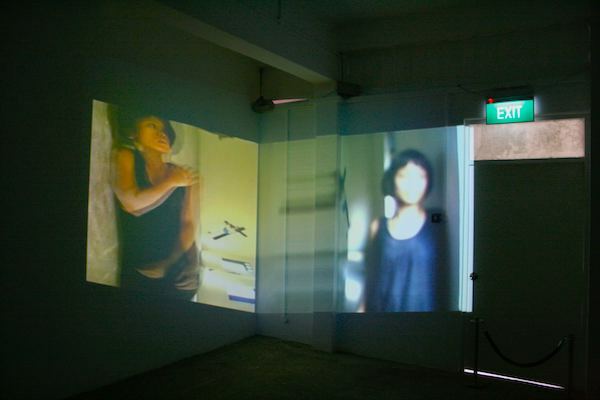 I Am Fit For Life (2001) was a 4-screen installation that premiered SENI, Singapore’s trial biennale, at the Singapore Art Museum. At one level is a series of someone doing exercise – hula-hooping, throwing five stones (a traditional Malay game) and so on. At another level, it was an angry declaration of autonomy. During 2002-2005, Kai travelled all over Japan, ‘islandhopping’ the many islands of the archipelago. As an islander (from Singapore) myself, she thought of this endeavour as a re-imagination of the idea of the ‘island’, by looking at a set of islands, from the point of view of an islander, and via the Japanese aesthetic concept of ‘ma’ or so-called negative space. For 3 years with her video camera, she collected and collapsed together conflicting images, music and text. Of the disparate narratives, a major set relates to that of the Pacific war. She networked footage from a trip to an American military camp in Okinawa with a hidden camera, the peace ceremony at Hiroshima during which the message of Japan as victim was propagated; the controversial war shrine in Tokyo while impersonating as a Japanese, and an interview with her uncle of his ordeal during the Japanese occupation of Singapore. This is a large body of works spanning different genres and media. 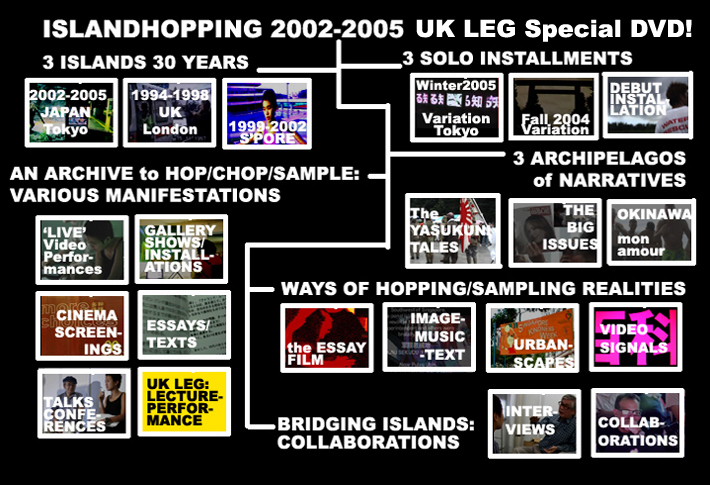 Different parts and combinations of ISLANDHOPPING have been widely exhibited, for instance at the Biennale of Sydney 2006 (as depicted), ICA London, House of World Cultures Berlin, and with 5 solo exhibitions in Japan. As the audience navigates through the densely-montaged films or the packed installation, they are also ‘islandhopping’ and re-imagining new ‘islands’ and ‘archipelagos’ of meanings. In 2007, commissioned by the Singapore Art Show, Kai made The Rather Terrible Slaughter of the Tour Guide! This consisted of 2 video tours filmed in the same location. The audience could select which tour to go on, both located in the main shopping district of Singapore. 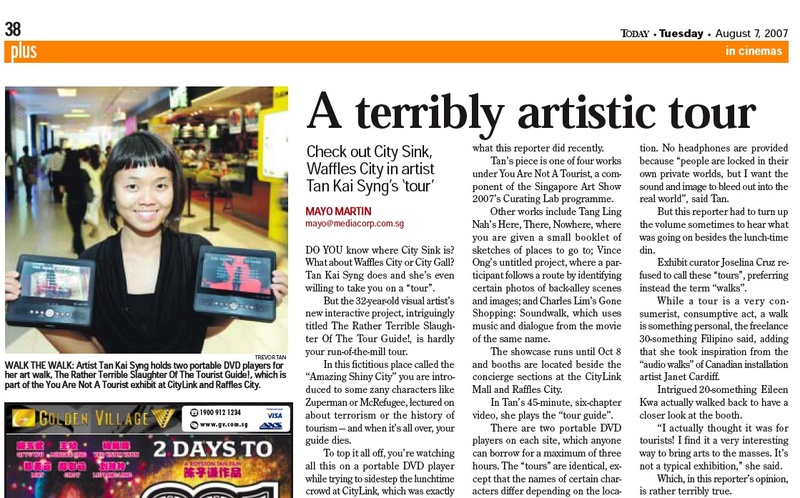 Kai changed the name of sites, for instance from City Hall to ‘City Gall’, and City Link to ‘City Sink’ in my artwork. Along the way, you ran into urban denizens such as the ‘Flaneur’ and ‘Godzilla’ (renamed ‘Godsiliao’, or ‘god has died’, in local dialect). The two tours were Tour Guide! Video tours identical, save for name changes such as someone called ‘Local’ in one, who is called ‘Global’ in another. This was Kai’s way to question the validity of these terms which are thrown about easily in a city that likes identifying itself as ‘globalised’. At the end of the tours, the tour guide/artist died. Curator: Joselina Cruz. A Fool On A Stool In School Drawing Margins To Exercise Her Common Sense (2008) is a 2-room, multi-screen installation in which Kai lies on the ground or against the wall and turns her body. She also runs about as if the star/victim of a theme park, albeit one of a disused school, to be converted to a white cube of a contemporary art museum, in which the same video was to be exhibited. This work dealt with the binary-feature of destruction/renewal, which characterises land-scarce Singapore. Kai shot and performed this work wearing a hard hat when the building was being renovated. The work was commissioned by the 8Q Contenmporary Art Museum in Singapore for its inaugural opening. The audience experiencing the work also re-lived the history of the room and building where they stood. Curator: Kwok Kian Chow. 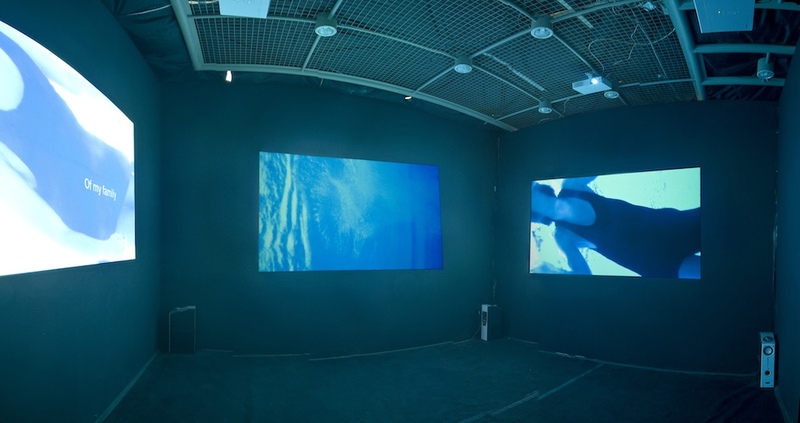 In 3-screen installation Here, There, Where (2008), Kai plays a person suspended in a liminal space that resembles a fish tank. Was she sinking or floating? Was she immobilised, or free? The video was shot underwater with an underwater camera by Michal Larsson. Music by Philip Tan. 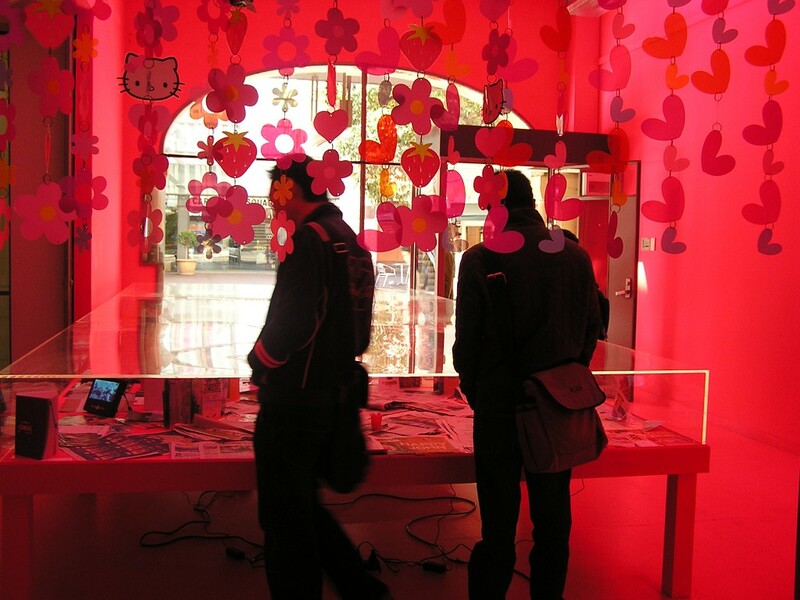 The work premiered at the Guangzhou Triennale 2008, which had the theme Farewell to Post-Colonialism. Kai was categorised under ‘Free Radicals’. Research curator: Sopawan Boonnimitra. Curators: Gao Shiming, Sarat Maharaj, Chang Tsong-zung. Other artists and curators at the Triennale include Werner Herzog, Trinh T. Ming-ha, Feng Mengbo, Chen Chieh-jen, Roger Macdonald, Jun Nguyen-Hatsushiba and Ade Darmawan. The Amazing Never-ending Underwater Adventures! is a permanent public video installation made in 2009. Kai played ‘Desyphus’, which is a neologism of ‘Sisyphus’, ‘Decipher’ and ‘Deceit’. Desyphus is a perpetual rider of the Circle Line of Singapore, which has 29 stations, in a series of 29 video cycles that comes on each evening at 19:29hrs (when it is sufficiently dark), at a total run time of 29 minutes, with 29 riddles for commuters to solve as they descend 35 metres underwater into the station. 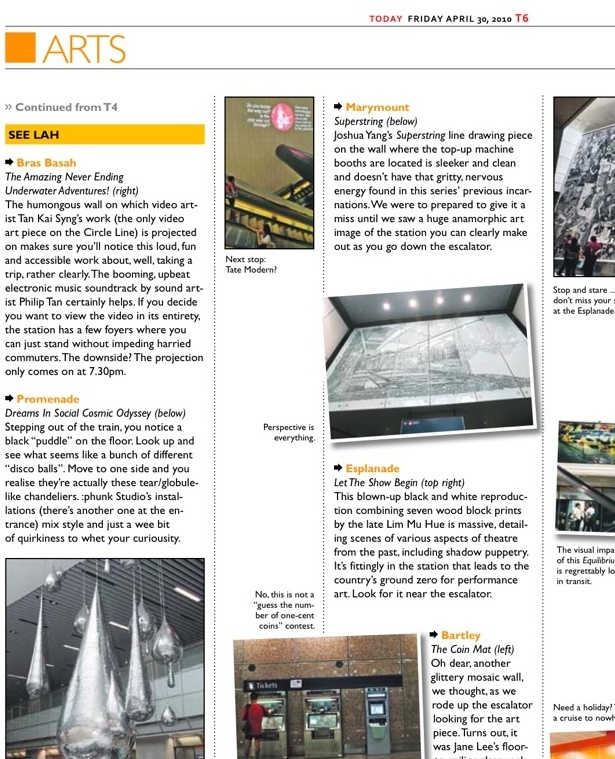 The work is a permanent video installation, and it is the only new media work commissioned by the Land Transport Authority of Singapore. It is sited at Bras Basah Mass Rapid Transit station, which is a subway station located at the Civic and Arts and Heritage district of Singapore. Music by Philip Tan. 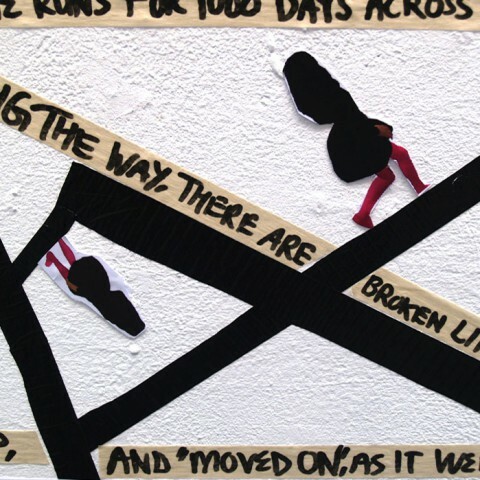 The work was voted by arts journalist Mayo Martin as his favourite of the artworks that run on the Circle Line. Read about the work here, here, here and here, and watch video clips here and here. Above: ISLANDHOPPING Sydney Leg 2006: Installation at Biennale of Sydney 2006. 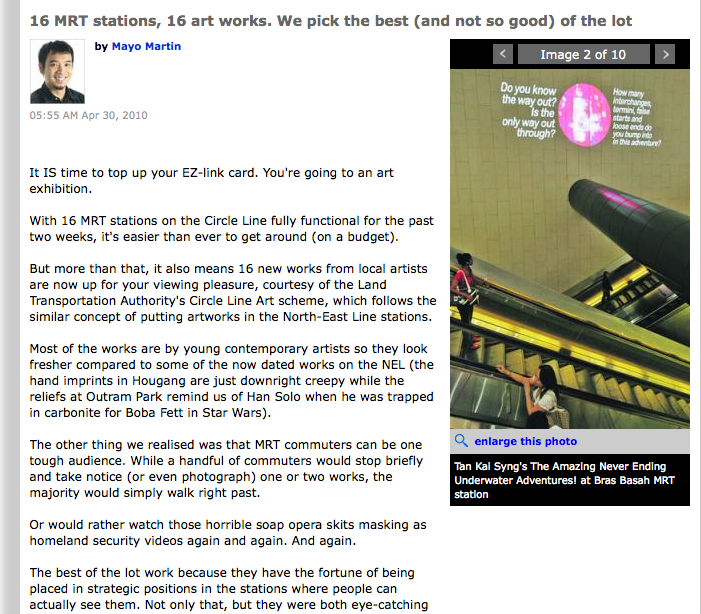 Below: 2009: Review in the Today newspaper. Senior writer Mayo Martin votes The Never-Ending Underwater Adventures! as his favourite of the lot on the Circle Line.